We influence services by working closely with health professionals by suggesting ideas and improvements for the future. Carry out ‘Five Senses Surveys’ of the 4 chemotherapy units in County Durham and Darlington. Conferences/Workshops, e.g. Chemotherapy Services, Acute Oncology Services, ‘Finding 1,000 People, Saving 1,000 Lives’ etc. 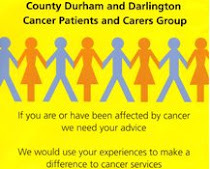 County Durham & Darlington Foundation Trust - Cancer Services Group and Acute Oncology Group.